Can't get enough of foil? Then you gotta go for the new Panini Elite Basketball. Elite is a long standing brand that's all about the foil. This year's edition brings basketball collectors some excellent looking foil inserts and parallel cards to chase. Of course those looking for memorabilia and autographs won't be left out either. 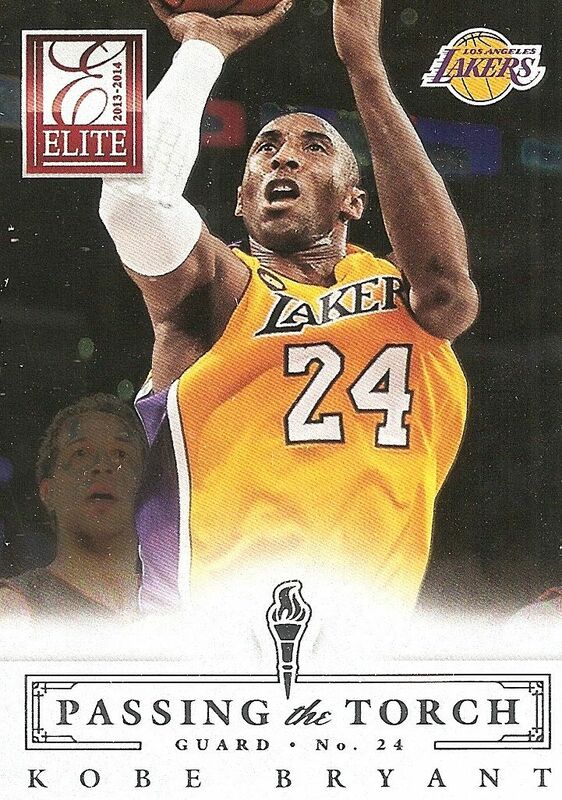 There are all sorts of things to find when you purchase a box of 2013-14 Elite Basketball. 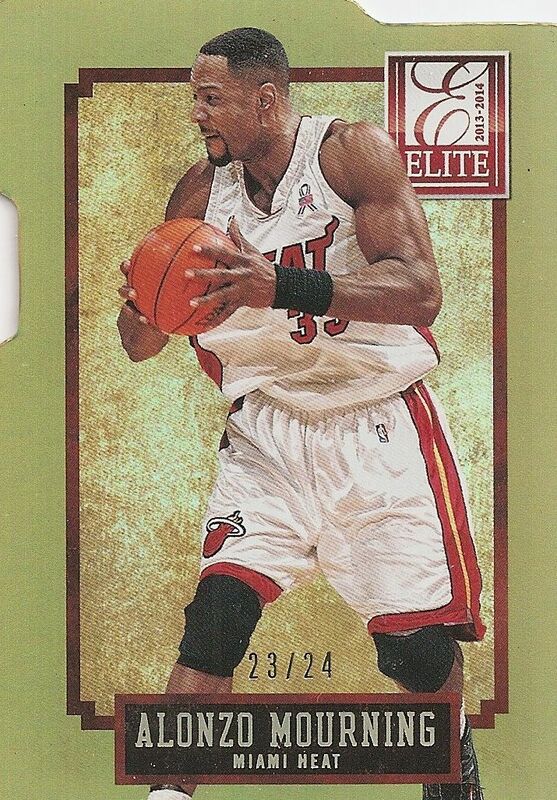 The 13/14 Elite base cards use a very simplistic portrait-type design. The border creates a pretty thick foil frame that surrounds the player photo. Thankfully, the thick frame does not fully enclose the player - the player is overlaid in front of the frame, which creates a popping out effect. While the card is uncluttered and clean, it is too much so. The thick borders create too much space so that the cards lack a bit of visual impact. Halving, or even cutting the border to a third, would have been a better look in my opinion. The back of the Elite base cards are not the typical Panini design... and whenever that happens I have to give them props. The Elite backs are more visually interesting than the fronts. The card number is large and easy to see, and the card has been partitioned into different parts. Each section contains relevant stats, facts, or graphics. The player photos have been darkened and saturated with red. I was a bit mixed about this, as maybe a full color photo would have been better... but I'll give Panini a pass here as the dark red photo matches up with Elite's red color scheme. 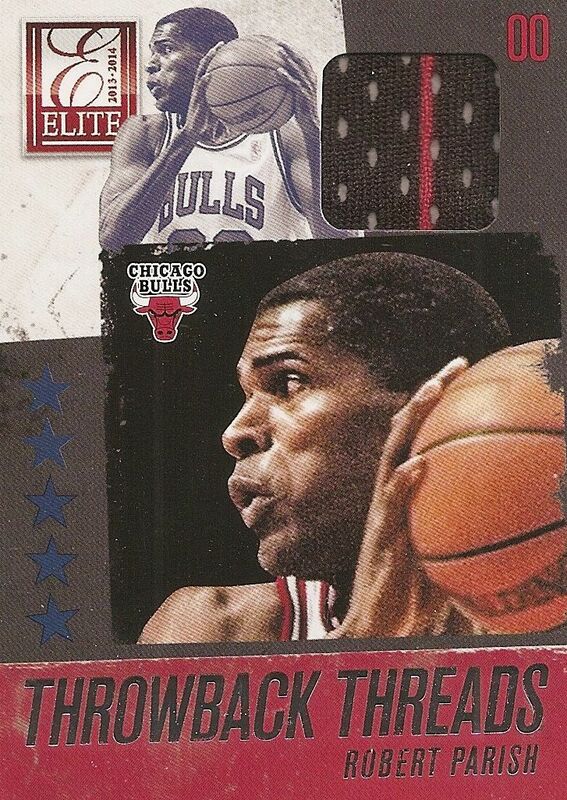 NBA veterans are represented in Elite with a limited edition subset. There isn't anything to denote the veterans save for serial numbering to 999. I think making the veterans harder to obtain is a good idea as they should have special status in comparison to the current NBA players. This also makes completing the base set a bit more challenging. 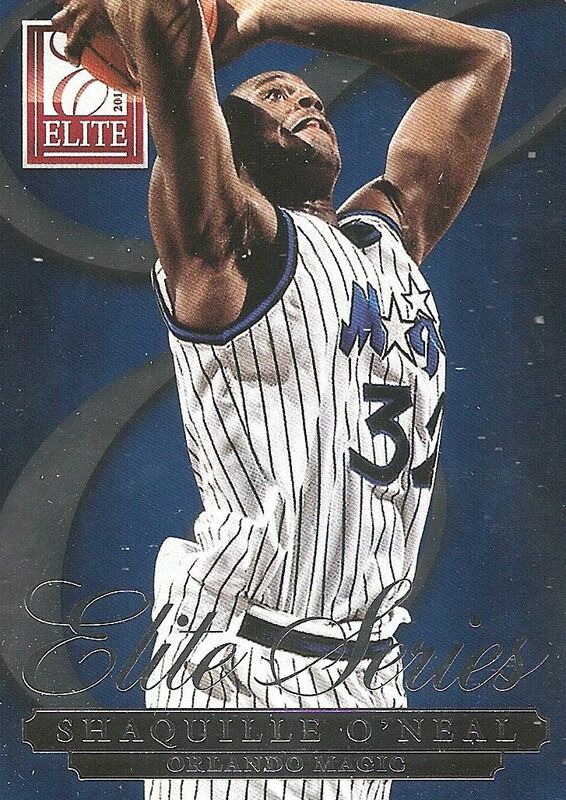 The rookie cards in Elite are also numbered to 999. Unlike many other Panini sets, these rookie cards do not benefit from autographs or memorabilia. If you're looking for an affordable rookie card, Elite might be the place to look. Being numbered to 999 makes this rookie card set a bit easier to put together, which is nice for some collectors. For the well-to-do collectors out there, these are probably not as enticing to chase. While having a name like Elite sounds like a super-premium product, it really isn't (though it was when it came out years ago). Elite has been regulated to a mid-level offering. Unlike some of the super-premium products with only a handful of packs per box, Elite packs in 20 packs in each box! It makes for a fun, and longer, rip. The insert cards in Elite make extremely good use of the foil. These Elite Series inserts make good use of an up-close photograph on a team-color centric background. These cards look outstanding, and I wouldn't mind having a set of these cards. 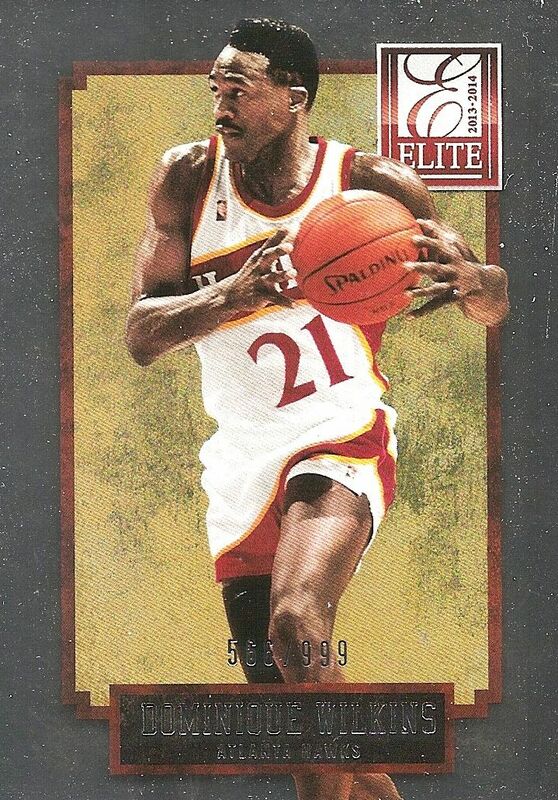 Had these cards come out in the 90's, I would have been all over them. I still really appreciate how stunning these cards look, but in today's crowded hit-focused card market, they sadly will not get the 'must have' attention from me that they should. 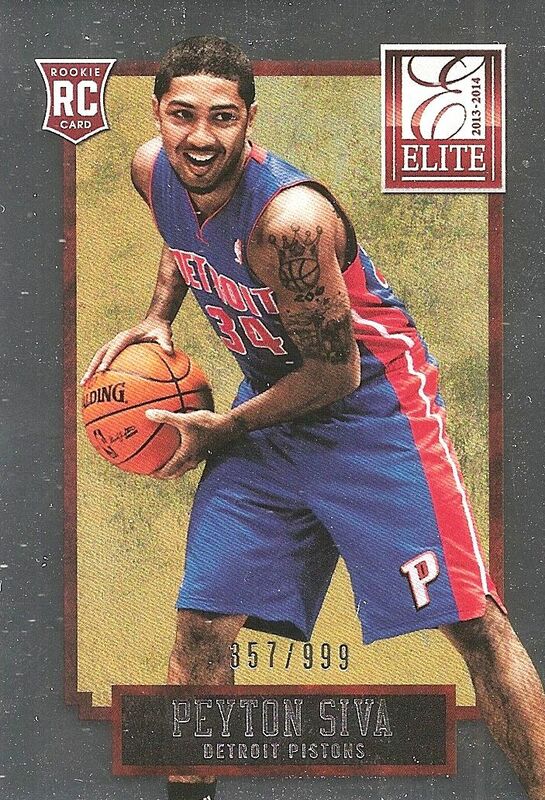 Franchise Future cards have a similar design concept to the Elite Series set. 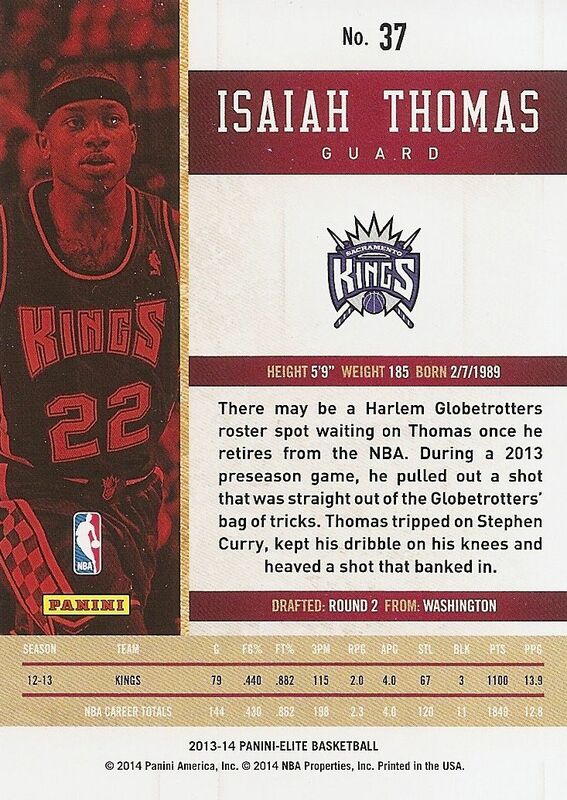 These cards feature a larger player photo in front of a rich foil background. These cards are much busier than the Elite Series, but it works as the design really goes well with the rookie context that they represent. Passing the Torch cards ditch the graphical background. The result works nicely as the true background that the player is a part of looks great in foil. The bottom white portion of the card is elegant looking with the silver foil trim. The Passing the Torch inserts are dual sided with a player on each side. This card has Kobe Bryant on one side and James Harden on the back. Unfortunately, only one side has the foil treatment. Face 2 Face inserts allow for two players to share the same side of the card. I am usually not a fan of dual cards like this with two players on the same side (to me, it's too crowded), but these look about as good as they can. The foiled up hardwood is especially sweet looking. Status (and Aspirations) parallel cards are found throughout the Elite set with all sorts of different numberings. The gold die-cut card shown above is numbered to just 24. Black versions are one-of-ones. Player collects would be wise to check the numbering of the parallel cards of the player they collect. It might be a super short-print! My particular box of Elite came with three Throwback Threads insert cards. Two of them were simple jersey cards like the Robert Parish above. Though they are only jersey cards, I do think Panini has done an excellent job with the design of these. I've got to hand it to them, as plain as I thought the base cards were, the insert sets are completely on-point. The autographed jersey version of throwback threads has variable numbering depending on the player. 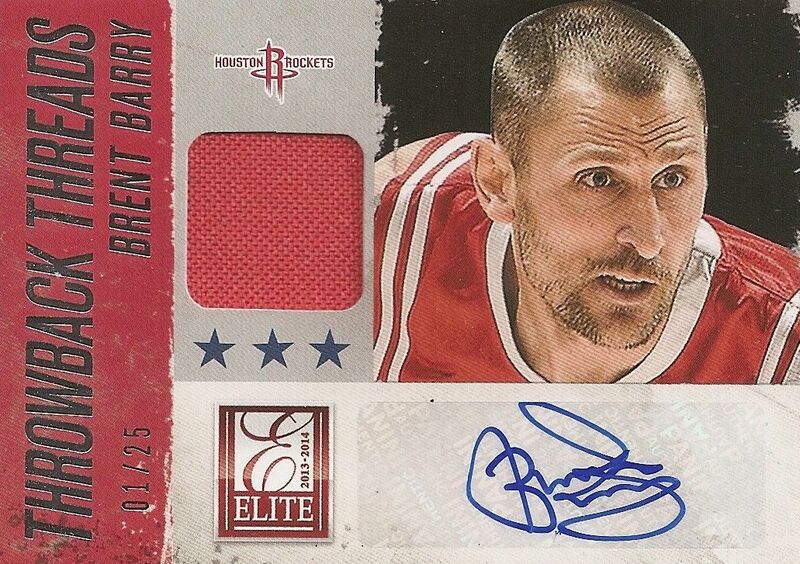 The Brent Barry card is limited to 25. New Breed cards feature memorabilia and autographs of the rookies. Like with all the other inserts I've seen, Panini has got the look of these cards down pat. To me, these New Breed cards have a futuristic look that is perfect for these first-year players. This memorabilia set is very modern and slick. Limited prime variations can be found as well. Unfortunately, my box was a bit overloaded on Throwback Thread cards, but Elite does offer quite a bit more in terms of memorabilia set variety. If you're interested in what Elite has to offer, do a quick search and see what other goodies can come out of this new product. 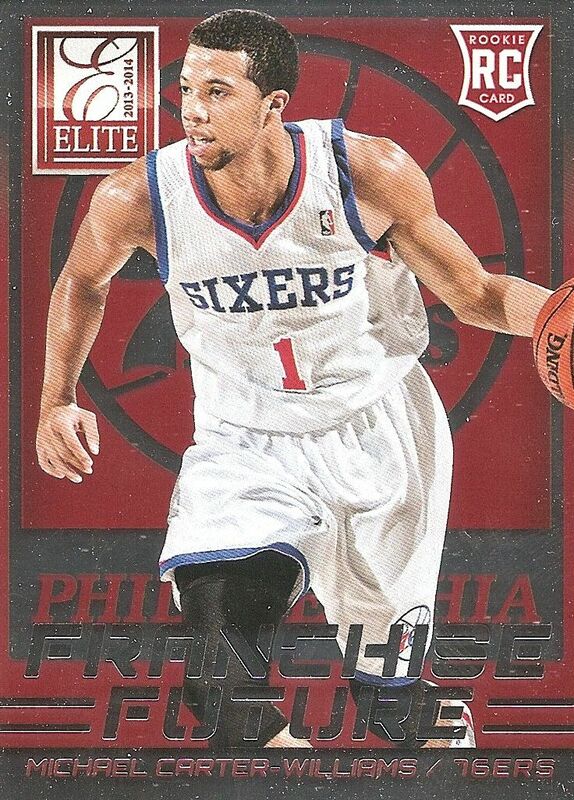 Elite is a very enjoyable set with some great looking cards within. It's definitely not a game-changing product though. I doubt people will be clamoring to hunt these cards down, but for collectors who enjoy a well-made card... these are definitely cards to set your eyes on buying. In fact, as a product that that sits right in that mid-level area, it makes for a relatively affordable romp into basketball cards. I would definitely recommend it as something to buy for newer collectors, or for people looking to get into the hobby. It's a product that shows that cards can look great, and has a solid amount of hits and base cards per box. Elite hits the sweet spot in that area. 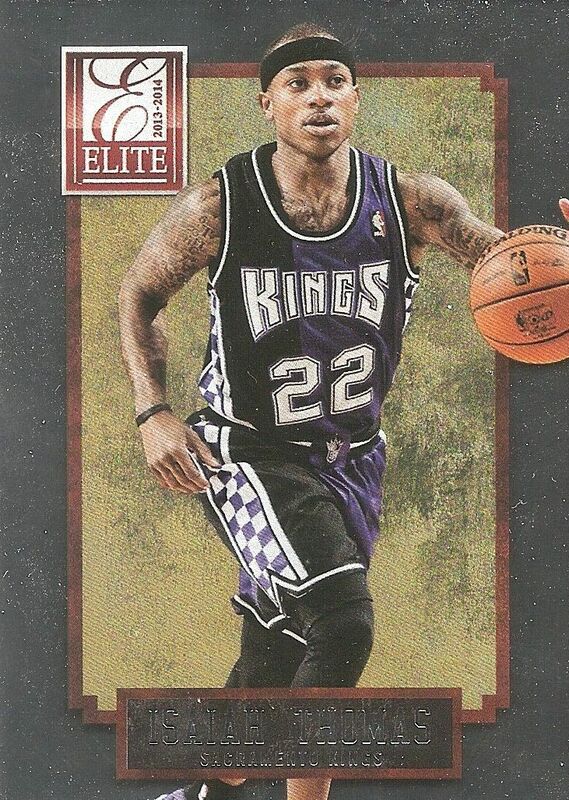 This year's Elite Basketball is a solid, balanced, basketball card product. It's certainly worth checking out, especially if you've enjoyed it in the past. Elite looks really great this year and im looking to get the LaMarcus Aldridge cards from Elite. Inserts are very great and I want to own some of those Elite Series cards. 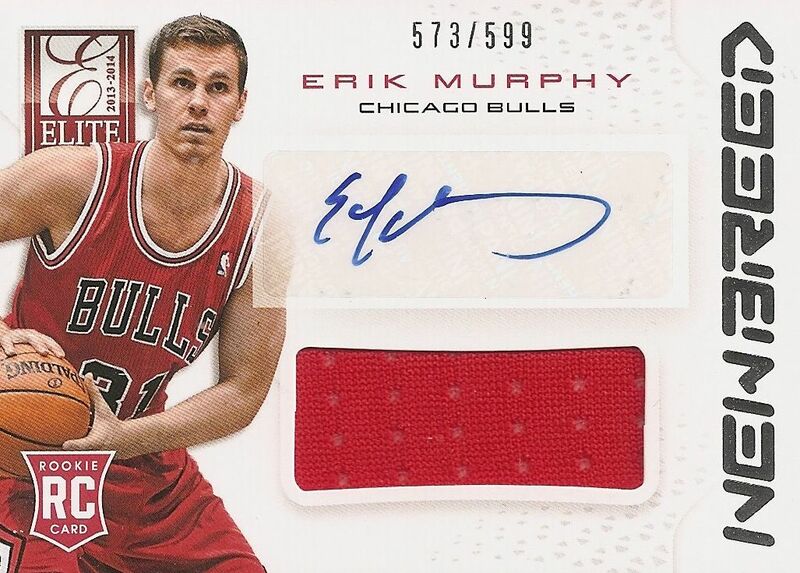 The jersey auto cards are cool. Adding the jersey makes up for the sticker. I like the throwback threads idea; good to have veterans in there. Unique Packaging, nice lookin base cards and relic cards! Nice that both your autos had jerseys as well. One thing I definitely noticed is that the Elite series cards look much better than they did in hockey. Elite is a great product. Great inserts nice base design. I never buy basketball cards or watch basketball but this got me intrigued especially the die cut cards which look amazing! Elite this year looks very good. A solid box for collectors. Like the base card design and the nee breed hits look very very nice. Curious to see more of the better cards pulled from this product. Thanks Blacksheep! 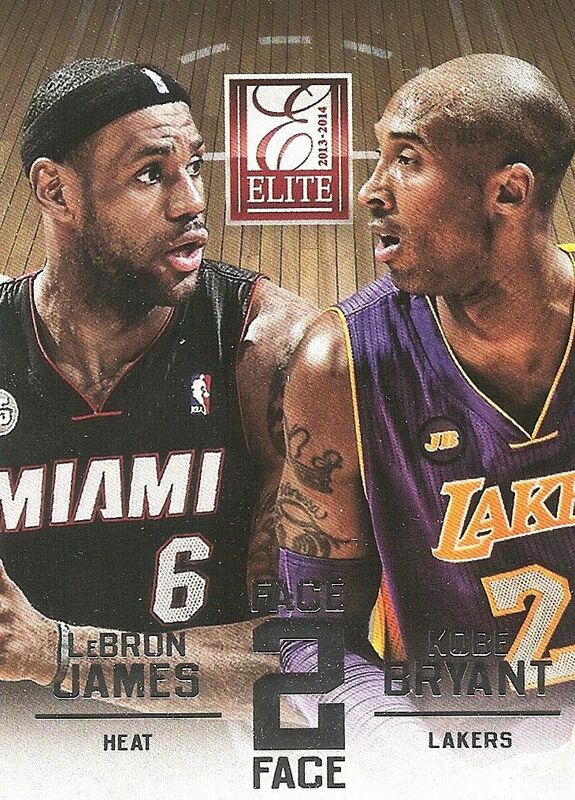 + The Elite Series cards are extremely well done. Perfection! - The base card fronts are very bad looking. The border is way to big, and not even the frame design in the back does look good to me. This set is a nice surprise this year - Just like the Toronto Raptors! Of course theres then panini with millions of autoes of player who have played few minutes on nba! Those autoes must go straight into bin! Basketball is a popular game and the passion for basketball will bring some weakness for us, therefore, we have several collections of basketball products. Elite is a well-known brand name that we have found in different basketball products. Especially in basketballs, basketball hoops, and different other basketball products.